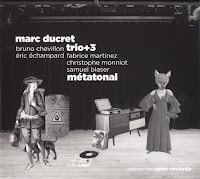 Recorded live in December 2014 at Le Triton, France, over several nights, the Marc Ducret Trio (Bruno Chevillon – Double Bass, Eric Champard – Drums & Marc Ducret – Electric Guitar) are joined by a horn trio of Fabrice Martinez – Trumpet, Christophe Monniot – Saxophones and Samuel Blaser – Trombone. The five tracks that make-up the album consist of a good balance of pre-composed and improvised material. The album literally kicks-in with ‘Dialectes’, the trio power housing a strong and hammering sound with Ducret’s guitar producing a repetitive sustained siren-like sound whilst the industry of Eric Champard’s drumming keeps the textural intensity through the rhythm, which gradually falls away to a much sparser sound world of cymbals, wandering bass line and a sympathetic and freely improvised lead line from the guitar. The piece eventually picking-up it’s intensity with the trio rocking-out towards the end of the track. Not much is heard from the horns during this first piece for the trio, but apart from that there is much in this first piece that gets played out over the rest of the album. 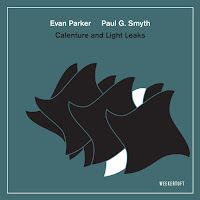 The pieces on Métatonal appear well structured in form, moving from more worked through elements to sections where the musicians get to roam more freely creating quite clearly defined sections within the music which is also highlighted between the strong contrasts in texture and dynamic range. 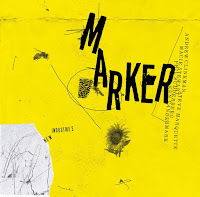 Intricate and spidery single lines are also juxtaposed against full-on slabs of rock, riffs and noise-based materials. The solid and dexterous bass playing of Bruno Chevillon holds the pieces firmly in place through different tempi and time signature changes with the horns embellishing the music with their presence more as an elaborate ornamentation in an orchestral sense rather than an integral part of the group’s music. This is not to say that the horn section are superfluous add-ons, as Samuel Blaser’s searching trombone solo illustrates in ‘Kumiho’, clearly taking centre stage both musically and structurally within the piece, not to mention Monniot’s saxophone dialogue with Ducret in the same piece. 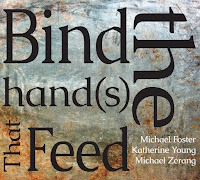 However, the horns presence is cleverly utilised to bring another dimension to the trio’s playing offering a much wider array of sound and colour over the course of the album and only being used to provide that in a compositional sense. 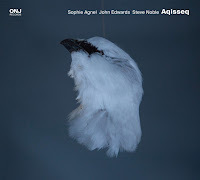 Because of that there is an emphasis on structure throughout the album, but this in no way bogs down the individual playing, particularly that of Ducret whose guitar playing is completely on form, weaving his atonal (or metatonal) lines into a magical web of free complexity. The third track ’64…’ includes the Bob Dylan tunes ‘The Times They Are A Changing’ and ‘Wigwam’, the latter eventually being used as a solid backdrop for the horns to swarm over whilst dovetailing and overlapping their phrases. Whilst the former sounds completely refreshed and vibrant with it’s African-esque rhythmic accompaniment, horn-led chorus and extended harmonies. 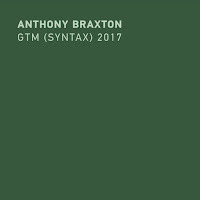 This is a highly original album that does not return to well-worn formats when seeking structural unity, but instead finds a good musical balance between grounded form and more inspirational moments. The recordings are excellent and the balance between the instruments is that of studio quality with the vibrancy of a live recording. This is a fantastic album from the guitarist, which clearly contains his vision as well as his excellent playing.